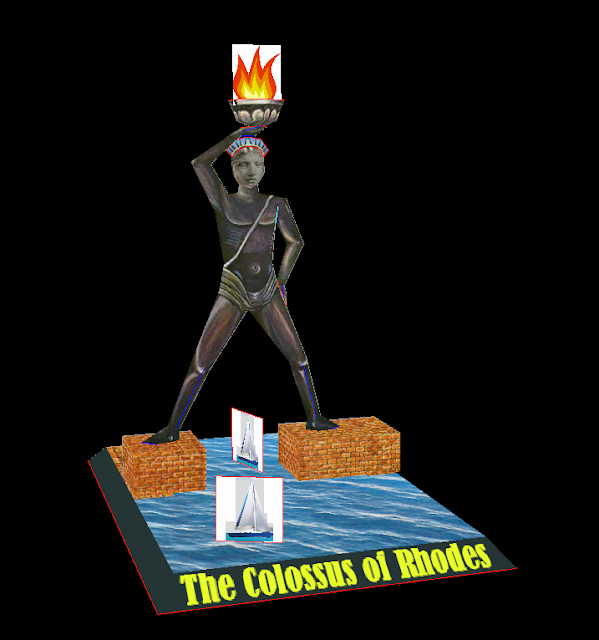 The Colossus of Rhodes was a statue of the Greek Titan Helios, erected in the city of Rhodes, on the Greek island of the same name, by Chares of Lindos in 280 BC. It is considered one of the Seven Wonders of the Ancient World. It was constructed to celebrate Rhodes' victory over the ruler of Cyprus, Antigonus I Monophthalmus, whose son unsuccessfully besieged Rhodes in 305 BC. Before its destruction in the earthquake of 226 BC, the Colossus of Rhodes stood over 30 meters (98.4 ft) high, making it one of the tallest statues of the ancient world. Build order: Base, brick walls, head, body, arms. bowl (add flame if you want to), legs and add boats if you want. How come you haven't built any of these models?